I was asked to look at the floor of a townhouse that is seeing some extreme settlement / deflection of the last two joists in the second level floor over the course of the past year. The structure was built around 2000. The first level is a garage which is setback 32" behind the front wall of levels 2 & 3. The floor is flat and level until you get to the garage wall below. The next joist 16" away is over 1/2" lower BFF and the joist at the exterior wall is down a little less at 3/8" BFF. There is no apparent destress in any of the walls and the situation is not present on the third level. The floor is plywood with vinyl flooring so no big loads. The depressed area of floor seems to extend for most of the width of the room be I cannot tell if it is at the joist bearing walls due to furniture in the way. I was asked to assess whether or not the problem is structural in nature which is clearly is. A recently appearing 5/8" drop of one joist in a floor is a structural concern but I need to write a report and what to site code reference. The structure was built under the 1997 UBC which has section 1613 - Deflection with the same limits as today of LL-def = l/360 & DL+LL-def = l/240 but I am not certain that this is deflection of the joist. I could also be a bearing elevation problem I am thinking possibly a joist hanger failure. My understanding is that the plywood subfloor also needs to meet the deflection limits so given 1/2" drop in 32" that give l/64 so based on the deflection of the sheathing being l/64 >> l/240 we have a structural failure. In this building cosmetic issues are the responsibility of the unit owner and structural issues are the responsibility of the association. Of course the association says that it is not structural and the owner needs to prove that it is. Here is a photo of the floor with a 6' builder's level flat on the rest of the floor. Let's face it- if you are seeing that much deflection with mostly dead load only then you have a structural problem. Need to tear out some sheetrock to fully assess. I hate when a client wants me to report on something structural like this but won’t allow any opening up works! Let me get my x-ray goggles so!! I wonder if these same people go to the mechanic and asks him to find out what’s wrong without opening the hood?! Is there any chance this is along the edge of an unsupported ply sheet? -The outer joist may be sagging less because the wall above is acting as a deep beam although I think I see a window in the picture. -Is the 5/8" at the center and gets less as it you move away from the center of the joist? -Do the 2 outer joists set on a cantilevered beam? -Any plumbing or other possible cuts? -Are you sure the outer edge is not a double or triple joist? 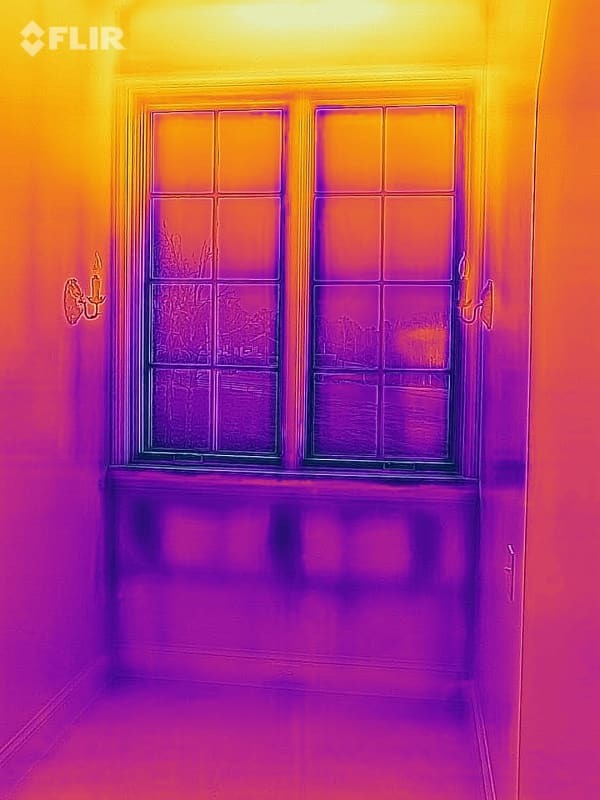 If you do have a drywall ceiling that is directly fastened to the joists, a thermal imaging camera may give you a little more info without tearing stuff out yet but I think you will have to rear out drywall. Does not work so good if there are hat channels or other spacers present. I bought a thermal imaging camera that goes on my Iphone for about $400. Works great on directly fastened drywall but not on spaced drywall or thick plaster. In the picture below, I found out a window was reframed to make a shorter opening. As far as X-Ray vision, I just tell Client's I have a bad motorcycle wreck when I was 15 and at that time I lost both my ability to predict the future and my X-Ray vision. Moving furniture to check levels at the bearing walls seems like a good idea and does not require special equipment. That would be my preliminary recommendation. The first sketch suggests that the third joist from the right is in contact with the partition below. This could be acting like a bearing wall, preventing deflection. The joists which appear to have deflected are supporting a partition above, so they appear to be carrying more load than the typical joist. 1) Obviously, I don't know any more about the existing framing setup than you do so keep that in mind. 2) This sounds like a situation that I've encountered a fair bit in residential work where designers are not identifying situations having a high potential for differential settlement issues. Here's a somewhat related Structuremag article: Link. 3) I think that the delineation between "structural" and "cosmetic" is a bit of a red herring and should, rather, be between "structural safety" and "structural serviceability". If this situation is what I suspect it is, then I would likely categorize that as a serviceability issue and not a safety issue. Beyond that, I think that it's up to the owner and association to decide what should be done with the situation. In their parlance, I suspect that [structural = safety] and [cosmetic = serviceability]. 4) I think that tying this issue to code deflection limits is tenuous at best. The individual framing member may well satisfy those limits. It's probably just the sheathing that does not and it's a bit of a stretch, in my opinion to make the leap [framing member limits --> intended max floor slope --> sheathing slope limits]. I'd be inclined to point out that competent design is not, and has never been, merely a subset of what is specified in codes and standards. The issue appears to be a result of the designer's poorly conceived layout. I would also look at the foundation of the condo to determine if it level. I will try to answer all the questions above. I was in a hurry last night and did not complete the sketch. There is a beam line under the exterior wall that I did not show. I think that it is entirely possible that the 3/8" adjacent to the wall is just deflection of the sheathing from the exterior rim-board and the inside of the 2x6 walls. See revised sketch. -The outer joist may be sagging less because the wall above is acting as a deep beam although I think I see a window in the picture. <haydenwse> There is a beam line under the exterior wall. It is wrapped on the outside so cannot see condition but the wrapping does not appear to be deflected or out of level. I suspect that the 3/8" drop is only at the interior side of the 2x6 wall as shown in my revised detail. -Is the 5/8" at the center and gets less as it you move away from the center of the joist? <haydenwse> It was fairly consistent for the distance that was available at the time I looked at it. -Do the 2 outer joists set on a cantilevered beam? <haydenwse> The end supports are not visible from below but the soffit that runs from the garage wall out to the beam is continuous across that location so I am assuming that the rim boards of the party walls extend out over the top of the exterior wall beam and that the rim boards have joist hangers that support the middle joist. I think that the most likely candidate for this loss of elevation is a failure of the hanger. the soffit is lower than the garage ceiling on the other side of the garage door wall and has ventilation so the joist could drop without showing in the soffit. -Any plumbing or other possible cuts? <haydenwse> There is no plumbing in this area. -Are you sure the outer edge is not a double or triple joist? <haydenwse> I cannot be sure but I do not think is it a triple. A single would make more sense with the sheathing deflecting down from the exterior face." BAretired: The garage door wall below is capable of carrying load but that joist is at essentially the same elevation as all the clear-span joists (not shown)to the left. The joist that had the lowest elevation is a clear span joist between the garage wall and beam line with very little load on it. KootK: I would tend to agree with you regarding a concern about an uneven floor. In this case, we have one joist that has in the past year dropped 5/8" relative to the joists on either side of it. I would not expect 3/4" plywood subfloor to deflect 5/8" with joists spaced at 32". Given this sudden onset (less than a year on a 20 year old structure) of an isolated single line of support (one joist) this appears to me to be well beyond the serviceably side of the scale. The code likes wood construction due to its inherent ductility because it gives us plenty of warning before collapse. If we ignore abnormal deformations then we need to do so at our own peril. Meh. I take any utterance by a homeowner with a grain of salt as much of it is insurance motivated. It's always something that just happened recently somehow. There's probably been a baby grand or a 200 gallon fish tank sitting up against that wall for the past twenty years prior to this "recent" failure. KootK, I would not expect either of those situations to cause one joist to be 5/8" below its neighbors. 5/8" is a lot and it carries pretty much consistently for the 9-10 feet that are available to observation. KootK, I would not expect either of those situations to cause one joist to be 5/8" below its neighbors. I was just being facetious. Although I'm not sure I agree. The joist to the left stays put because of the wall. The joist to the right stays put +/-. Put the leg of a piano or a fish tank stand up near the wall and you'll definitely load that middle joist. 5/8" is a lot and it carries pretty much consistently for the 9-10 feet that are available to observation. And what segments of the span are that? If a hanger's gone loose, I'd expect that to be only one hanger, not both. So I wouldn't expect a uniform drop but rather, a monoslope. And if it was a hanger, and there weren't loads applied at that location, why now? Baring some serious rot or something, unloaded hangers don't just spontaneously fly off after 20 yrs. Would you happen to know when the unit last changed hands from one owner to another? KootK, my client is the original and only owner of this property and has continuously occupied it. In line with Kootk's comment on Owner comments, I generally find something I kind of know the answer to but ask it anyway to see how they respond. I am somewhat testing them, but it helps me assess what happened. The item I ask about may have nothing to do with the issue at hand. Unless there is a large window or something present, I would assume something was placed against the wall at some point in time. I also noted that you say this has 3 levels. Is something heavy on the 3rd floor against that wall and it is pushing down on 2nd floor via the wall? I agree with Kootk, I would think a hanger loose would make that contribution to sag monoslope while beam sag would be a U-shaped contribution. When you say this mostly occurred in the last year, is that based on them just noticing it a year ago or did they call you a year ago? This one would require removal of coverings but I forgot about how many times I had a "head scratcher" joist sag/fail because a tension face knot finally cracked through. I do not know of any research where knot defects like that are investigated as they may or may not be related to creep. They are definitely related to a very temporary overload. The attached pic is from an overload. The cracked knot is hard to see from the side I photographed but real easy to see on the other side. Not sure if this is relevant. 30+ years ago an executive at one of our industrial clients had some deflection issues with a living space over his garage. My boss sent me to look at and review the problem. It was an older house and the deflections in the joists were very noticeable. The second floor room was a guest bedroom. My recollection is that the joists were adequate for the spans, spacing, loading, etc. We concluded that because the garage was not completely insulated and sealed, varying relative humidity and temperatures could affect the woods modulus of elasticity (E) which would then affect the deflections. This was addressed in some texts that concluded that there was no rebound effect as E went back up, resulting in creeping. 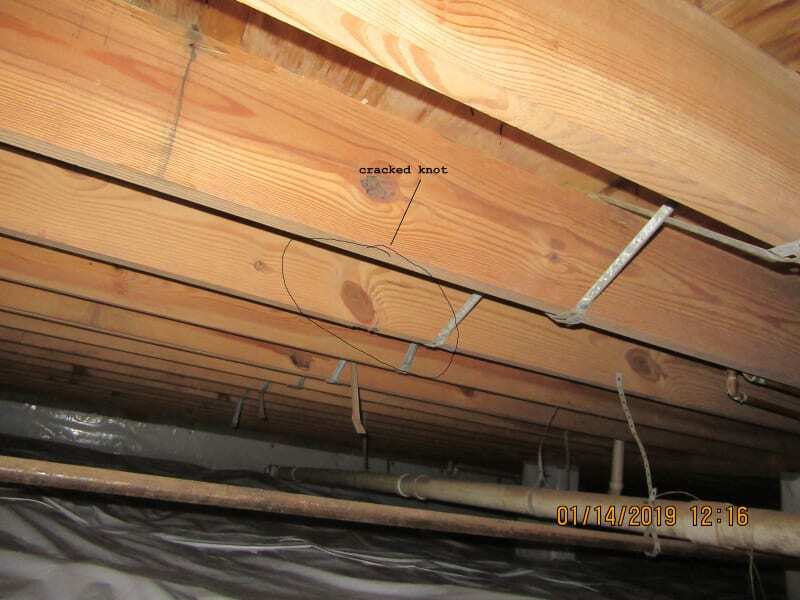 Maybe your joist that is “outside” of the garage has experienced creep over its life.